Copyright: © 2017 Thongprasom K, et al. This is an open-access article distributed under the terms of the Creative Commons Attribution License, which permits unrestricted use, distribution, and reproduction in any medium, provided the original author and source are credited. Ulceration is a breakdown or discontinuity of the epithelium. The common causes of oral ulcerations are trauma from a malpositioned tooth, a sharp tooth cusp, broken restorations, partial denture clasp arms, and orthodontic brackets. Lesions produced in this fashion are called traumatic ulcerations. Various autoimmune diseases such as pemphigus, lupus erythematosus, and mucous membrane pemphigoid also manifest as oral ulcerations, including erythema, erosions, and persistent ulcers . On close oral examination, these ulcerations are observed to have irregular margins [2-4]. RAU is considered as the most common oral mucosal lesion of unknown etiology. These lesions present as recurrent, multiple, small, or ovoid ulcers with yellow floors and are surrounded by erythematous halo, and commonly appear first in childhood or adolescence. Minor types of RAU present as round or oval lesions with a diameter less than 1 cm and heal within 2 weeks . When recurrent aphthous-like lesion occurs in the middle-aged patient for many years, it is definitely uncommon. Pemphigus vulgaris (PV) is a rare autoimmune mucocutaneous disease that manifest intraepithelial blisters formation. Although PV is considered an idiopathic disease, various environmental factors that trigger the disease have been identified, including medicines (especially thiol-containing drugs, e.g., penicillamine and angiotensin-converting enzyme inhibitors), diet (garlic, onion, leek), and physical or viral agents [6-10]. The first manifestation of the disease are oral lesions in 50-90% of cases [6,11-16]. Some studies have found major differences in the prevalence of oral lesions as the first manifestation of PV among distinct geographic areas, e.g., 66% in Bulgaria, 83% in Italy, and 92% in Israel  The laboratory diagnosis assays for diagnosing PV include, Tzanck smear (acantholytic cells detection), standard histology (suprabasal acantholysis detection), direct immunofluorescence (epithelial tissue intercellular space deposits of immunoglobulin G, M, A, and C3 protein), indirect immunofluorescence (serum pemphigus antibodies detection), and ELISA test using recombinant Dsg1 and Dsg3 (serum anti-Dsg1 and anti-Dsg3 antibodies in serum detection) [6,11,16,18]. The antibodies found in the intercellular spaces of the epithelial tissue are usually IgG type, however, IgM or Ig A types, and complement protein C3 can also be observed . Physician, dentist and patient should consider the recurrent and long-term oral ulceration particularly in the middle-aged patient. A 46-year-old, male with a history of recurrent oral ulceration more than 10 years was reported here and oral pemphigus was a final diagnosis. A 46-year-old male was referred to the Oral Medicine clinic at the Faculty of Dentistry, Chulalongkorn University. He had a history of recurrent oral ulceration for over 10 years. His history revealed that the ulcerations first erupted on the tongue, floor of the mouth, vermillion border, and buccal mucosa. The lesions were treated with triamcinolone acetonide 0.1% in orabase. The ulcerations underwent partial remission; however, the lesions recurred on the oral mucosa. He denied a history of celiac disease or familial history of RAU. He had a history of migraines and had been treated with caffeine and ergotamine; however he currently had no symptoms and not receiving treatment. This patient also reported peptic ulcers beginning 10 years ago; however, the condition was normal at that time. Therefore, he did not take any medications to treat any systemic diseases. The patient’s oral examination demonstrated fair oral hygiene; however, the right buccal mucosa had 2 mm round and 2 × 3 mm oval lesions (Figure 1a). The soft palate had 1 mm and 2 mm round ulcerations. The lingual marginal and attached gingiva at the mandibular left premolar and molar showed desquamative epithelium (Figure 1b). These areas were treated with fluocinolone acetonide 0.1% in orabase and fluocinolone acetonide 0.1% in solution (FAS). Benzydamine hydrochloride 0.15% w/v mouthwash was also prescribed (approximately 1 tablespoon) every 1½-4 h prn for pain relief. The histopathologic appearance of a left buccal mucosa biopsy was reported as an intraepithelial bullous lesion. Indirect immunofluorescence showed IgG and C3 positivity at the epithelial intercellular space with a titer of 1:160. Oral pemphigus was the definitive diagnosis. One month later, skin lesions erupted on his chin and chest. Bullous ruptured with hemorrhagic crust on top of the lesions was seen on his chest (Figure 2). He was then referred to the dermatologist for further treatment. Figure 1: (a) Right buccal mucosa showed round and oval shape of aphthous-like lesions. (b) Marginal and attached gingiva on the left mandibular premolar and molar at lingual side areas showed desquamative gingivitis. 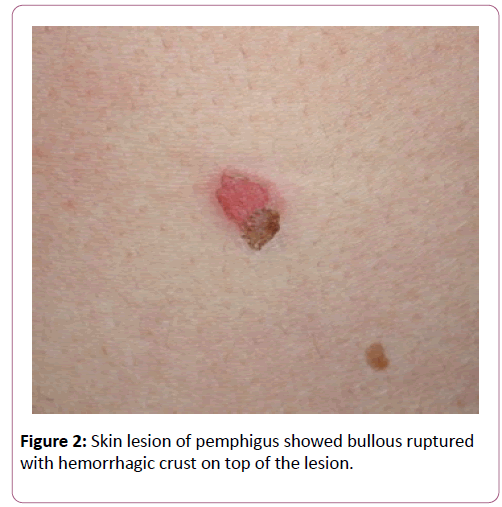 Figure 2: Skin lesion of pemphigus showed bullous ruptured with hemorrhagic crust on top of the lesion. Recurrent aphthous ulceration (RAU) commonly appears first in childhood or adolescence. The minor types of RAU present as round or oval lesions surrounded by a 1 cm diameter or less erythematous halo and heal within 2 weeks . When treating RAU, clinicians should perform a skin–patch test for allergies to food additives, flavoring agents, and essential oil. Moreover, a gluten-free diet was successful in reducing RAU episodes in patients with and without celiac disease . In addition, folate, vitamin B12 levels should be investigated to rule out of RAU . However, the indirect immunofluorescence results in this case confirmed the diagnosis of PV. Therefore, full laboratory investigations for nutritional deficiencies and skin-patch test were not done in this case. This was due to the high cost of laboratory investigations and the patient refused further blood tests. Long-term and recurrent oral aphthous-like ulcerations together with desquamative gingivitis in middle-aged patients should be carefully considered. The oral ulcerations in this case showed well-defined margins, which is different from the irregular margins in classical oral pemphigus. Oral PV typically presents as erythema, erosions and persistent ulcers. The surrounding epithelium is friable and the mucosa breaks down when stroked. Oral pemphigus is a fatal oral autoimmune disease and oral lesions usually precede skin lesions. The most commonly affected site of PV in Thai patients is the gingiva and buccal mucosa . However, gingival desquamation associated with oral ulceration may indicate a mucocutaneous disease, such as lichen planus, pemphigus, or mucous membrane pemphigoid . Dentists are typically the first person to make an early diagnosis of pemphigus, thus preventing lesion progression to important organs and saving the life of pemphigus patients from secondary infection or side-effects from high dose steroid treatment. Although the use of oral corticosteroids, azathioprine and mycophenolate-mofetil, are the most common oral pemphigus treatment, wide variation in treatment have been described, such as biologic therapies (rituximab, intravenous immunoglobulin [IVIg]) . One report presented remission in oral pemphigus over 12-years after treatment with the combination of potent topical steroids, FAS 0.1% and systemic steroid, without any serious side-effects . Importantly, cooperation between the oral medicine specialist and physician is useful in the PV treatment. The clinical implication of the findings in this case is that the physician and dentist need to carefully evaluate and should not ignore longterm recurrent aphthous-like lesion in middle-aged patients that may be a serious autoimmune disease, such as PV. Long-term aphthous-like lesions in a middle-aged patient together with desquamative gingivitis should be carefully evaluated, because it may be a serious autoimmune disease, such as Pemphigus. Dentists often the first clinician that can make an early diagnosis of pemphigus and preventing lesion progression to important organs. Oral medicine specialists can play a role in saving the life of pemphigus patients from secondary infection or side-effects from high dose steroid treatment. We would like to thank the Institute of Dermatology, Bangkok, Thailand for providing histopathological and immunofluorescence reports in this case. We also thank Oral Medicine staff for their assistance. Our thanks go to Dr. Kevin Tompkins for editing this manuscript. Neville B, Damm D, Allen C, Chi A (2015) Oral and Maxillofacial Pathology. (4thedn), St. Louis, Saunders, Elsevier, pp: 712-744. Bagan J, Muzio L, Scully C (2005) Mucosal diseases series. Number III Mucous membrane pemphigoid. Oral Dis 11: 197-218. Black M, Mignogna MD, Scully C (2005) Number II. Pemphigus vulgaris. Oral Dis 11: 119-130. Petri M, Orbai AM, Alarcon GS, Gordon C, Merrill JT, et al. (2012) Derivation and validation of the systemic lupus international Collaborating clinics classification criteria for systemic lupus erythematosus. Arthritis Rheum 64: 2677-2686. Akintoye SO, Greenberg MS (2005) Recurrent aphthous stomatitis. Dent Clin North Am 49: 31-47, vii-viii. Ruocco E, Baroni A, Wolf R, Ruocco V (2005) Life-threatening bullous dermatoses: Pemphigus vulgaris. ClinDermatol 23: 223-226. Bystryn JC, Rudolph JL (2005) Pemphigus. Lancet 366: 61-73. Brenner S, Wolf R (1994) Possible nutritional factors in induced pemphigus. Dermatology 189: 337-339. Mutasim DF, Pelc NJ, Anhalt GJ (1993) Drug-induced pemphigus. DermatolClin 11: 463-471. Dagistan S, Goregen M, Miloglu O, Cakur B (2008) Oral pemphigus vulgaris: a case report with review of the literature. J Oral Sci 50: 359-362. Ariyawardana A, Tilakaratne WM, Dissanayake M, Vitanaarachchi N, Basnayake LK, et al. (2005) Oral pemphigus vulgaris in children and adolescents: a review of the literature and a case report. Int J Paediatr Dent 15: 287-293. Shamim T, Varghese VI, Shameena PM, Sudha S (2008) Pemphigus vulgaris in oral cavity: clinical analysis of 71 cases. Med Oral Patol Oral Cir Bucal 13: E622-E626. Camacho-Alonso F, López-Jornet P, Bermejo-Fenoll A (2005) A presentation of 14 cases and review of the literature. Med Oral Patol Oral Cir Bucal 10: 282-288. Ben Lagha N, Poulesquen V, Roujeau JC, Alantar A, Maman L (2005) Pemphigus vulgaris: a case-based update. J Can Dent Assoc 71: 667-672. 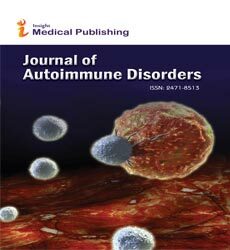 Mihai S, Sitaru C (2007) Immunopathology and molecular diagnosis of autoimmune bullous diseases. J Cell Mol Med 11: 462-481. Brenner S, Tur E, Shapiro J, Ruocco V, D'Avino M, et al. (2001) Pemphigus vulgaris: environmental factors. Occupational, behavioral, medical, and qualitative food frequency questionnaire. Int J Dermatol 40: 562-569. Scully C, Mignogna M (2008) Oral mucosal disease: pemphigus. Br J Oral MaxillofacSurg 46: 272-277. Shakeri R, Zamani F, Sotoudehmanesh R, Amiri A, Mohamadnejad M, et al. (2009) Gluten sensitivity enteropathy in patients with recurrent aphthous stomatitis. BMC Gastroenterol 9: 44. Thongprasom K, Youngnak P, Aneksuk V (2002) Hematologic abnormalities in recurrent oral ulceration. Southeast Asian J Trop Med Public Health 33: 872-877. Iamaroon A, Boonyawong P, Klanrit P, Prasongtunskul S, Thongprasom K (2006) Characterization of oral pemphigus vulgaris in Thai patients. J Oral Sci 48: 43-46. Stoopler ET, Sollecito TP, DeRossi SS (2003) Desquamative gingivitis: early presenting symptom of mucocutaneous disease. Quintessence Int 34: 582-586. McMillan R, Taylor J, Shephard M, Ahmed R, Carrozzo M, et al (2015) World Workshop on Oral Medicine VI: a systematic review of the treatment of mucocutaneous pemphigus vulgaris. Oral Surg Oral Med Oral Pathol Oral Radiol 120: 132-142. Thongprasom K, Korkij W (2002) Fluocinoloneacetonide 0.1% solution and prednisolone in the treatment of oral pemphigus: 12-year follow-up. Eastern J Med 7: 47.